PROVIDENCE, RI – April 2, 2019 – Mahr Inc., a leading provider of dimensional metrology solutions, today announced the addition of the MarSurf GD series for roughness measurements to its new line of surface measuring instruments. MarSurf GD series measuring stations provide unprecedented levels of speed, flexibility and intelligent ease of use, allowing users to improve the manufacturing quality of workpieces with faster throughput and higher accuracy for the broadest range of applications. Developed from the ground up with the leading technology, quality and innovation that Mahr is known for, the new MarSurf GD series enable profile and waviness evaluations to be carried out in addition to surface roughness evaluations. The MarSurf GD series significantly increases the speed of all moving axes to reduce the cycle time of the measurement process, allowing more throughput which is particularly valuable when used directly in the production environment. The drive units of the MarSurf GD series move the probe with positioning speeds of up to 200 mm/s, making the systems up to 40 times faster than predecessors. All Z-axis columns on the measuring stands of the MarSurf GD series are fully CNC-capable with fast positioning speeds of 50 mm/s, which is up to five times faster than standard Z-axes on the market today. 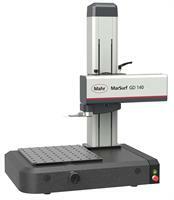 The MarSurf GD series also offers the ultimate flexibility with available sizes of 140mm and an industry-first 280mm. The 280mm measuring station allows for the measurement of applications that were previously impossible, including larger parts or a series of smaller parts staged together—all on the same machine.